I’m no stranger to death. My mom hung herself before my first birthday. I don’t remember her, though. Other than missing having a ‘real’ mom and wondering how my life would have been different with her in it, I don’t really think about it much. At least not any more. And so I wouldn’t really say I’ve grieved that loss. Not really. Affiliate links may be used in this post. If you click on one and make a purchase, I may receive a small percentage at no extra cost to you. Read my full disclosure policy here. My maternal grandma died the winter before I turned 11. As a child, death was just weird to me. I saw Grandma in her casket and it looked to me like she was just sleeping. It didn’t make sense to me that she wouldn’t wake up although I knew that’s what being dead meant. I cried for my grandma…and for myself. I would miss playing Crazy Eights with her and eating her fabulous fried chicken and the way she always stuck up for me when my big brother picked on me. And it’s true, I did miss those things. But do you know what? After a few days passed, my life became busy again with normal 11-year-old stuff. Oh, I still missed Grandma on occasion, but it wasn’t a crying-filled, gut-wrenching kind of missing her, and so I was fine. What have you learned about grief? Ten years later, another grandma died. This time, I cried not just for the things I would miss doing with her but also for the events in my life she would miss. She’d never see me graduate from college or get married. She wouldn’t know my kids and even worse, they would never know her. I spoke with my stepmother about these things and she assured me that the differences in how I felt between grandmothers had to do with my own growth and maturity level. I guess it makes sense that at different ages there would be different reactions, especially when it came to losing a grandparent. My sorrow lasted a little longer than before but eventually I became busy with my own things, and my life again moved on. I never quit thinking fondly of her and missing her, but those things never got in the way of my living. And then, David died. If you are wondering who David is to me, I guess I’d pretty much call him the best friend I’ve ever had. He was my supporter, my encourager, my motivator. He was my ‘goodness’. When he died, I died too. Oh, not physically…obviously. But I learned quickly that there’s a difference between existing and living. I hadn’t really known that before. When trying to survive David’s death, I thought back over losing my other loved ones and how I grieved for them. With David’s death, I couldn’t seem to function, and I was certain there must be something wrong with me. I experienced feelings and thoughts I never knew possible. Nothing had ever prepared me. No one had ever told me. Why didn’t they tell me? Who are they? I don’t know. Anyone. I felt sharp physical pain like someone gripped my internal organs into a vise and squeezed and twisted and turned them. It hurt. Physically. Like something was being ripped from me. I had no idea it could feel like that. 2. There is no timeline for grief. I grew up with the philosophy of ‘get over it’ and ‘move on’ whenever facing any difficulty. But this time, I couldn’t seem to get over it. Because of that, I wanted to know just exactly how long it would be until I quit hurting. I asked an online friend who had been through her own grief journey. “Julie,” she told me. “I wish I could give you an exact time, but I can’t. I guess, for me, it took about two years for the worst of the grief to subside.” Two years! That seemed like forever, but at least I had a timeframe. Well, when two years came and went and I still thought about David every day and still struggled to understand the point in living if we were just going to die, I knew that no one else’s time frame would work for me. Let me say for those of you in the early stage, the worst of the physical pain did subside within that two years so fortunately that doesn’t seem to last as long, at least it didn’t for me. I learned there is no time frame, and that’s okay. No one can tell another when to be finished grieving. It is a personal journey. I heard frequently that time heals all wounds. I disagree. It’s not the time that heals the wounds but rather what a person does with that time. And while we’re working on grieving, we can have as much time as we need. 3. Speaking of time, the third thing ‘they’ never told me about grief is that the way I measure time would change. Time became measured in relation to the date David died. From that very moment on, every news event that I hear about, every song that I think about, I measure when it happened as ‘David was alive when that happened’ or ‘that happened after David died.’ And I have the always present thought of ‘I wonder what David would think of that.’ Even now, almost 11 years later…’David was still alive when that happened.’ For example, in church, lyrics are posted on a screen at the front. At the bottom of each slide is the copyright date. I still find myself looking at that date and thinking about whether it was before or after he died. 4. Grief makes you question your faith. I thought I had faith; I was raised with faith or at least with God. But the thing is, as far as whether God was real or not, well, I guess I didn’t truly have faith. I believed in God, sure. I thought I did, anyway. I knew He could help me live a more caring and loving life, and I liked the idea of eternal life. I always figured, though, that if I was wrong and when we died we were just dead, it wouldn’t matter because we wouldn’t know. Gruesome way to look at it, I know, but it worked for me. Until David died. Then, I lost all my faith. I was so afraid there was no God and with no God, no point in living. If David could die, what was the point at all? There was none. It took a long time before I had a real glimmer of hope internally that he was okay and that I would be okay. An online friend (I ‘met’ lots of online friends during the early years because it felt safe to keep grieving with them. In my ‘real’ life I felt like I had to pretend to be okay) told me my faith must not have been very strong if I lost it so easily. That upset me at first, but then I realized that he might be right. Or maybe not. I think no matter what faith you have before the loss of a loved one, it’s going to be shaken. And that’s okay. It’s all okay. 5. Grief does not come packaged in a tidy little five stage plan. Oh, I know there’s validity learning about denial, anger, bargaining, depression, and acceptance; we need to know what they are to understand that it’s ‘normal’ to feel these emotions when grieving, but I discovered that, unlike my previous understanding of them, they are not experienced in order nor do they each last the same amount of time, AND once you’ve experienced one that does NOT mean it won’t make an appearance again years down the road. Hardly fair, huh? But it’s true. Once you get past the anger or denial, don’t be surprised when either pops back up again. It can present itself in the same way as it did before (anger at God, anger at yourself, anger at the deceased) or as in my case, it can present itself differently (anger and impatience with my spouse, my children, my co-workers). 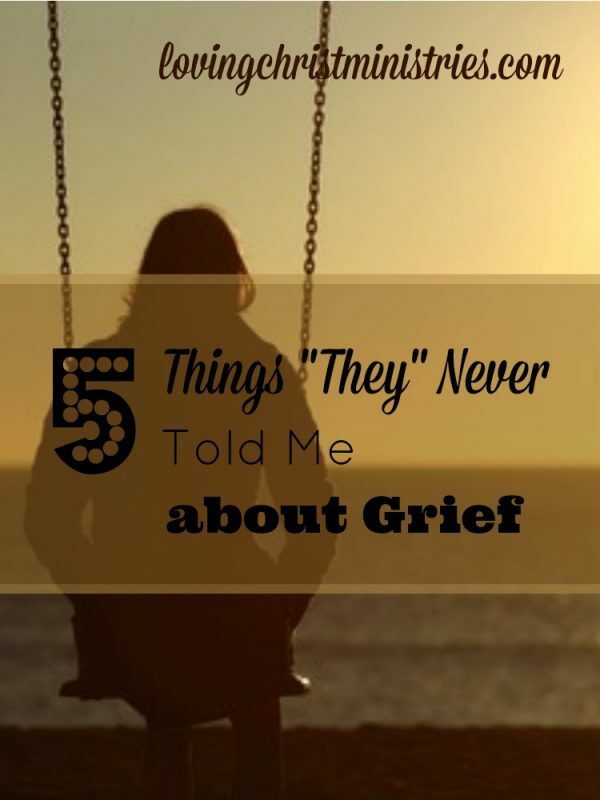 Maybe if ‘they’ had told me these things, grieving would have made more sense to me. I suppose it’s possible ‘they’ did tell me, and I just didn’t listen because it didn’t pertain to me. Hindsight, right? There is no ‘normal’ way to grieve and there’s no ‘getting over it’. There are as many ways to grieve as there are people in the world. Everybody’s experience is different, and each one is valid. No book or blog you read will make your grief go away. It doesn’t even go away with time or with a support group or prayer. It really never goes away. Instead of getting over it, you get through it. You’ll learn that it’s forever a part of you, and you’ll find strength as you learn and grow. You will still grieve; however, your grief will change. You can find purpose again. And joy. Those things are still out there even when you are at the bottom of the grief pit. When you’re ready, they’ll still be there. They’ll sneak into your life little bits at a time until eventually you’ll be able to function again. You’ll have your new normal. You will survive. What’s something you learned about grief that you hadn’t known before? Such great advice and wisdom. I too am not a stranger to death. I lost all my grandparents by the time I was 8, and several aunts and uncles in the last few years. You’re right there’s no timeline for grief. I find certain foods remind me of my grandma along with certain songs. Sometimes I feel the fact that my grandma, aunt, and great aunt were killed in a semi accident is why I fear driving. You’ve definitely experienced great loss. I’m so sorry! Yes, isn’t it interesting how things such as food can remind us of our loved ones. I can be scrambling eggs in the morning and have such an overwhelming sense of David that I could swear he was standing next to me. And as far as eggs in the morning go, I only have one special memory of morning eggs at a weekend church retreat with him. Those special times together are forever a part of us and any little thing that triggers that memory of them brings them close to us. Bless you! Thank you for this powerful post on grieving. You are 100% right that grief is a personal journey for each of us and the stages rear their ugly heads at any given time, in any given order, and over and over again. I am the youngest of three and the only girl and after a lengthy illness lost my mother in 2007 when my only child, a son was ten months old. The thing that has been really difficult for me is my son not knowing the greatest force in my life the way her other grandchildren do. Of coarse until I had my son never new I could love anyone the way I did my mother. And lastly, the mirroring of my relationship and it’s experiences with my son so closely reflect that with my mother that I am grieving her in the light of new eyes, my son’s and my relationship is soooooo similar to my mom’s and my relationship. It is a double edged sword, so beautiful and fulfilling yet so devastatingly lonesome for my momma. All the new experiences as a mother and they are so amazing and so like that with my mother. That has lessened some as my son gets on in his grammar years at school. We are still amazingly close but as he grows older, not as connected at the hip. The last thing I will say is that she was my greatest teacher, greatest believer, greatest inspiration to duplicate amazing relationships between parent and child. I thank God every day for her patience in her incredible career as mother and pray to emulate her all the way. Faith has ensured me that one day we will reunite and experience everything together again, my momma, my son, and me. Hebrews 11:1 – “Faith makes us sure of what we hope for and gives us proof of what we can not see.” Pamela, I’m so thankful your faith has ensured you that you will be reunited with your dear mother one day. I am so sorry for your loss and appreciate so much that you took the time to share here. One of the best ways to make it through our grief is through the support of each other. God bless you! This post really spoke to me. My “David” was Brendan. It’s been 8 years and it still hurts and I still think of him every day. Yes, I don’t think the time that passes keeps it from hurting. It seems at times like it was just yesterday and so long ago. I’m so sorry for your loss and appreciate you taking time to share here. God bless! Thank you for this post! I have walked through varying grief journeys as I buried a daughter, a marriage (because divorce felt like a kind of death to me), and then a sister. You nailed it when you said that time does NOT heal wounds…it’s what you do over time that leads to healing. I remember being told by another mom who had buried a baby, “Sabrina, each day, sometimes each hour, will present you with the choice to gradually grow better or gradually grow bitter.” That wisdom has guided so much of my life in the 18 years since then! Sabrina, such profound wisdom! Grief is definitely a journey where we sometimes just have to make the choice to get through the next minute. I’m so thankful for the joy and hope I find in God’s promises to us. God bless you! I had to stop and read this when I saw the title. First I was wondering who you were referring to as ‘they’ and I see what you mean by that. My family, including me has experienced more than what I would consider the normal amount of grief in our lives. Both of my brothers lost their babies to tragic accidents 4 years apart. Our family had not recovered from the loss of the 2 year old when the 4 year old was killed by a drunk driver in 1984. One of my brothers died when he was 42 after a serious illness. My children’s father died when he was also 42 several years after we had gone through a life changing divorce. My father died from injuries he received in a fire in 2009. His death was sudden and devastating and extremely hard to cope with for many years. My Mother died in 2012 after her 3rd battle with breast cancer. Momma died in March and my favorite uncle died in June then I lost my job in August. Momma had lived with me for 4 years prior to her death. It has been the loss of my mother which has been very difficult to cope with. I gained 15 pounds sitting on my sofa and crying every day for far too long. In all honesty, it was the holiday season of 2014 before I felt like I might be able to REALLY feel happy again. There is hope. Without God in my life, I would never have survived the grief in my life. It is not just my own prayers but the prayers of those who love me. It is my prayers for other family members also suffering and our close supportive relationships with one another that help us to survive. Coping with the loss of our loved ones changes us. It changes the way we view life and relationships. I think I have a greater respect for and appreciation for those I love and also for people who may be a part of my life even in some small way. I appreciate you writing this post! As you know, it really does help to voice and vent and share with those who understand the pain you feel. Oh Shirley, such loss in your life. Your faith is such an inspiration and encouragement. Thank you for sharing. God bless you! Julie, this is really powerful. The other thing no one told me was the way you can grieve the loss of a relationship. Our daughter and my best friend rejected me and although I still hold onto hope, it’s been ten years. I could relate to all of your points from that perspective as well. Thank you for this! Deb, you are so right! You can definitely grieve the loss of a relationship in the same way. My sister and I discussed this as we compared her grief over her divorce. We had so many similar feelings and emotions. I will put you, your daughter, and your best friend in my prayers. God bless!